Please note the below vacation overview, map, day-by-day itinerary, highlights, meals, accommodation information and optional excursions are from 2016 and are subject to change. 2017 vacation details and information will be available in the Fall. On this Essential Britain tour you’ll experience some of Britain’s most fascinating towns as you travel through England, Wales, and Scotland stopping for overnights in London, Plymouth, Cardiff, Liverpool, Glasgow, Inverness, Edinburgh, and York. 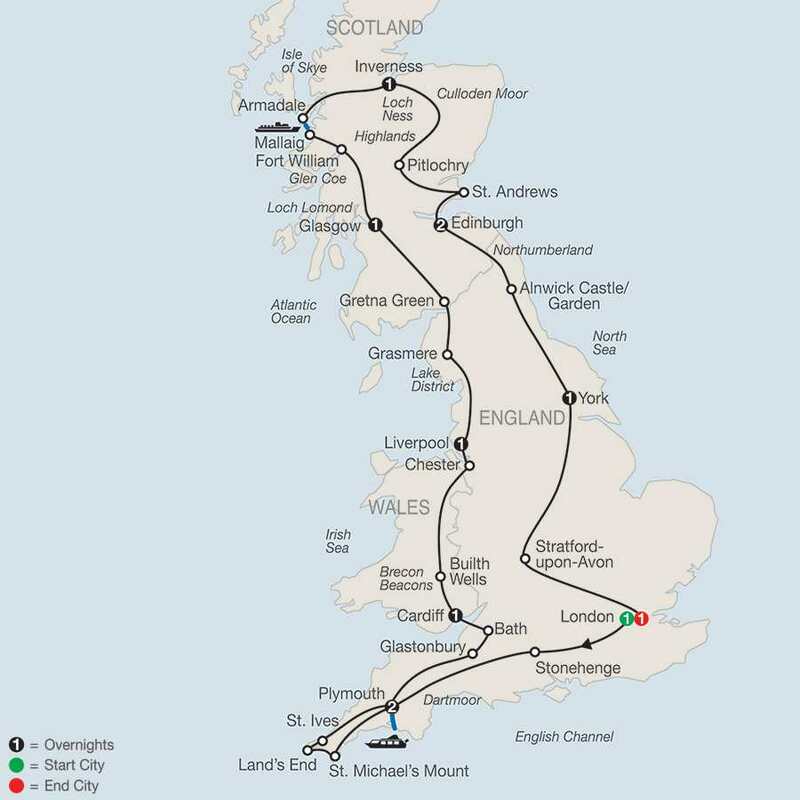 Plus, part of the charm of traveling through Britain is seeing the marvelous scenery and on this Britain tour you’ll get the opportunity to witness some of its most scenic areas. You’ll cruise on Plymouth Sound, one of the world’s great natural harbors; take a photo at breathtaking Land’s End, England’s most south-westerly point; drive through Brecon Beacons National Park, with its dramatic landscapes; explore England’s tranquil Lake District, England’s largest and finest natural park; visit the Isle of Skye, with some of Scotland’s best scenery and selected by National Geographic as one of the top islands in the world; and trace the shores of Loch Ness. On this tour to Britain, you’ll also travel to some of the charming towns. In Bath, you’ll explore the excavations of the Roman baths, used over 2,000 years ago for bathing and socializing. In Chester, you’ll enjoy a walking tour of this city famed for its Roman remains, black and white half-timbered buildings, and famous two-tiered arcades. In Liverpool, take a journey into the life of the Beatles. Walk through York’s quaint streets with your Tour Director, who will bring York and all of Britain alive with firsthand, in-depth knowledge throughout your tour. Globus also brings these destinations to life with out-of-the-ordinary experiences—such as an authentic Cornish pastry in Cornwall and original Grasmere gingerbread in Grasmere—arranged just for you. Majestic scenery, fascinating towns, special treats, an expert Tour Director bringing these destinations to life, and so much more are offered on this spectacular Britain vacation. Be sure to grab your camera so all you have to do is sit back and relax as you experience these wonderful destinations. Welcome to London! Uniformed Globus Hosts will be waiting to welcome you. After checking into your hotel and an afternoon at leisure, we recommend our optional Taste of London excursion with dinner, followed by a guided illumination cruise on the Thames River. Meet your Tour Director and traveling companions, and depart London at 8 am. First, try to unravel the mystery of prehistoric STONEHENGE; explore the stunning visitor center with its imaginative exhibitions, then take the shuttle to the stone circle and admire the magnificence of the monument up close. Continue on through Thomas Hardy’s Wessex, and head to Plymouth, where you follow in the footsteps of Drake, Raleigh, and the Pilgrim Fathers with a CRUISE on Plymouth Sound, one of the world’s great natural harbors. You will also have time at the historic Barbican to see the Mayflower Steps. Tonight, enjoy a welcome dinner with wine at your hotel. A day full of West Country sights as you head through Daphne du Maurier’s Cornwall, where you will be treated to an authentic CORNISH PASTY. After viewing St. Michael’s Mount, take photos at Land’s End before exploring the popular seaside resort of St. Ives. Back in Plymouth, why not join an optional excursion into Dartmoor National Park for an evening of storytelling at a local pub? At Glastonbury, hear about its associations with King Arthur, and in elegant Bath, see the amazing excavations of the ROMAN BATHS with time to explore further on your own. Stay the night in Cardiff, the Welsh capital. You might want to join an evening of Welsh entertainment and dinner tonight. Your journey through Wales takes you north along the Taff Valley and Brecon Beacons National Park, and via the ancient market town of Builth Wells to Chester. On your walking tour, see the Roman remains, the characteristic black and white half-timbered buildings, and the famous two-tiered arcades called the “Rows.” Spend the night in Liverpool; you may wish to join an optional city tour this evening. Start the day with a visit to the award-winning BEATLES STORY, an atmospheric journey into the life, times, culture, and music of the “Fab Four.” Later, focus on the tranquil Lake District, considered to be the finest of England’s national parks. Take a break in Wordsworth’s beloved Grasmere and try original GRASMERE GINGERBREAD. Then, head north for the Scottish border and stop at Gretna Green, where the blacksmith used to wed runaway couples, and take part in a WEDDING RE-ENACTMENT. Overnight in Glasgow, Scotland’s largest city. Follow the “Bonnie Banks” of Loch Lomond, then proceed via Rannoch Moor, Glen Coe, Fort William, and the “Road to the Isles.” At Mallaig, board your FERRY for the crossing to the Isle of Skye, the largest island of the Inner Hebrides and famous for its dramatic landscapes. Return to the mainland and trace the shores of Loch Ness on the way to the Highland capital. Main features today: the battlefield of Culloden Moor; Braemar, home of the Royal Highland Games; St. Andrews; and over the elegant Forth Road Bridge to Edinburgh. Tonight, an optional Scottish evening with Highland dancers, bagpipers, and the Ceremony of the Haggis. For departures July 30 through August 20, tickets are included for tonight’s performance of the world-renowned MILITARY TATTOO. Morning city sightseeing with a Local Guide introduces you to the 200-year-old “New Town” and famous scientists, inventors, and novelists who lived there. 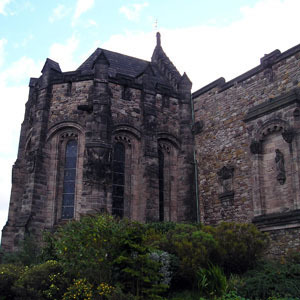 In the “Old Town,” drive up the narrow Royal Mile to EDINBURGH CASTLE to admire Scotland’s Crown Jewels, then explore HOLYROOD PALACE (when available). Later, a unique optional excursion: board the former Royal Yacht Britannia once the perfect royal residence for glittering state visits and family holidays. Dinner rounds off this optional evening. This morning at ALNWICK CASTLE the choice is yours: visit the CASTLE itself, the opulent ancestral home of the Duke and Duchess of Northumberland, or explore ALNWICK GARDEN, where the fountains and waterfalls are a breathtaking feature. Next, make your way to York, England’s most complete medieval city. Here, stand in front of the great structure of the Minster, then follow your Tour Director through a maze of quaint streets, including the narrow Shambles. On the last leg of your journey, stop at Stratford-upon-Avon to take pictures of Anne Hathaway’s Cottage and visit SHAKESPEARE’S BIRTHPLACE. On return to London at about 3:30 pm, a Shownight Theater Evening would be an incredible finale to your vacation. Departure June 20 – Stonehenge will be closed due to Summer Solstice and a visit to Salisbury Cathedral will be included instead. Edinburgh Military Tattoo ticket included for departures July 30 through August 20. This contemporary hotel is located within minutes of London’s famous landmarks in the heart of city. Dining options include Brasserie Joël, Ichi Sushi & Sashimi, 1WB Lounge & Patisserie and Primo Bar. The hotel also boasts a fitness centre with 15-metre pool and Mandara Spa. Complimentary Wi-Fi is available for guest throughout the hotel. The peaceful Holiday Inn Plymouth is surrounded by the grassy open spaces of Plymouth Hoe. Relax over dinner with views across Plymouth Sound from 11th-floor Elliott’s restaurant and bar. Exeter International Airport is a 50-minute drive away and Plymouth Airport 6 miles from the hotel. The 4 star Novotel Glasgow Centre hotel, close to Sauchiehall Street. This Glasgow hotel is also within easy reach of the city’s nightlife, shopping and the SECC. Enjoy warm Highland hospitality in Old Town Inverness at Mercure Inverness Hotel. Rebuilt on the site of the original Caledonian Hotel, the modern hotel is just 200 meters from Inverness train station and a caber toss from the city’s numerous pubs and restaurants. Where heritage meets contemporary elegance. The Dorsett Shepherds Bush offers stylish and comfortable accommodation for the most discerning guests to enjoy, relax, party and refresh. The 8-storey hotel with 317 rooms boasts modern architecture and design. The Pavilion is a Grade II listed building, which overlooks Shepherds Bush Green, retaining the building’s historic facade. The hotel offers 2 restaurants, destination bar, a spa and gym with the latest in cardio and resistance equipment. This contemporary, centrally located 1,054-room hotel is just a few minutes’ stroll away from the West End and Oxford Street, London’s major shopping area. 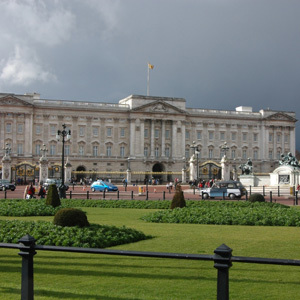 Hyde Park and Regent Park are nearby, as are art galleries, museums and theaters. Dine on international cuisine at Fiamma Restaurant, savor Asian Fusion favorites and views of London at Minako at the Met on the 23rd floor, or enjoy exciting sports events in the Sports Bar. Discover the latest additions to the hotel, the contemporary EDG Bar & Lounge and the Whisky Lounge, serving an impressive range of whiskies. The hotel also boasts a LivingWell Health Club, a 12.5 meter heated indoor pool, sauna, steam room and the beauty salon. Prices based on double room occupancy. Air fare is not included in the price. The following charges are not included in the land vacation price unless otherwise noted: airfare to and from the start of your vacation; Intra-vacation air unless specified in the itinerary; airline baggage fees including checked and/or excess baggage fees; Federal inspection fees for the Federal U.S. Customs and Immigrations; International Air Transportation tax; agricultural tax; other per person taxes imposed by government entities; airport taxes and fees including the September 11th Security fee up to $10 per person, passenger facility charges up to $18 per person, Federal domestic flight segment fees up to $3.70 per segment, and U.S. and International arrival and departure and other government-imposed added by the airline and applicable at time of booking; port taxes; passports; visas (except on Cuba programs) and vaccinations; tips to your Tour or Cruise Director, the tour company Group Leader in Cuba, Local Host, driver, Local Guides, and/or ship’s crew; gratuities on ferries, trains, and cruise ships; laundry; telephone; minibar; alcohol, beverages, and food outside of the contracted Globus menu as presented at a hotel or restaurant or onboard your vessel (these extra items will be billed to you before leaving the hotel, ship, or restaurant); airport transfers on non-qualifying flights; optional excursions; additional activities and excursions purchased online; porterage at airports and train stations; Travel Protection; and all other items of a personal nature. For air departure dates within 331 days, you’ll be offered a choice of carriers and flight schedules as well as price points to choose from when selecting your flights. Your schedule will be provided to you at the time of booking (schedules are subject to change by carriers). The tour company offers 2 air options: Flex Air and Instant Purchase Air. Flex Air allows flexibility if you want to make changes to your vacation schedule. Instant Purchase Air may offer additional airline options but has more restrictions. Some vacations may only offer one Air type option. Guaranteed air-inclusive prices: air is only available to passengers traveling from the United States and only available when booked in conjunction with a land vacation. An additional $300 per person non-refundable air deposit is required for Flex Air booked in conjunction with any land vacation (i.e. air-inclusive vacation). Air can only be booked by the tour company in conjunction with a vacation package. Instant Purchase Air requires air payment in full at time of booking (i.e. air-inclusive vacation) plus non-refundable service fee ($30 per person for North America, $50 per person for International air). Once booked, Instant Purchase Air is non-refundable, and non-changeable. Some vacations may only offer one Air type option. However, once your airfare is confirmed and the tour company has received your full air and land deposit, your air-inclusive vacation price is guaranteed.